Tabsite offers a wide array of widgets and tools to enable powerful and easy customization of promo apps! To use widgets, you must select to add a "Drag N Build" app when creating a new promotion, tab, or app for your web page. This then creates the Drag N Build App and gives you the menu below in the manager to setup and customize. Simply click on any widgets and drag the desired widget to your work area. One of the widgets is the Countdown Widget. Users should set the date and time to count down to and select the time zone to use. Daylight Savings Time is an option to use, and the English text of "Days, Minutes," etc. can be toggled off. This enables those wanting to display other than English the ability to turn the English off. 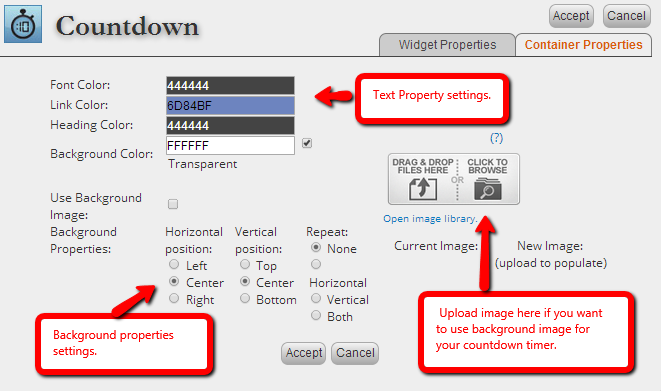 Then simply use a Content Widget to add text below the numeric countdown. You can design how you want your Countdown timer to look like through Container Properties settings. Here you set the background image and its properties along with the font color, link color, heading color and background color of the text. After creating your widget and settings. Don't forget to click Save. The Countdown Widget will display on a Drag N Build app as shown below. Options shown are with text, without text, and when the time has reached it's finish it displays all zero's. Countdown widget can be used to count down to special events, the start of a sale or promotion and more! Use creatively to draw buzz and create interest. Again, Drag N Build apps can be deployed on a Facebook Page or website and there is access by mobile users on Facebook when using the Smart URL.